Two members from Liverpool Croquet Club, James Hawkins and Paul Rigge, battled it out in the Southport Jubilee Advanced tournament. 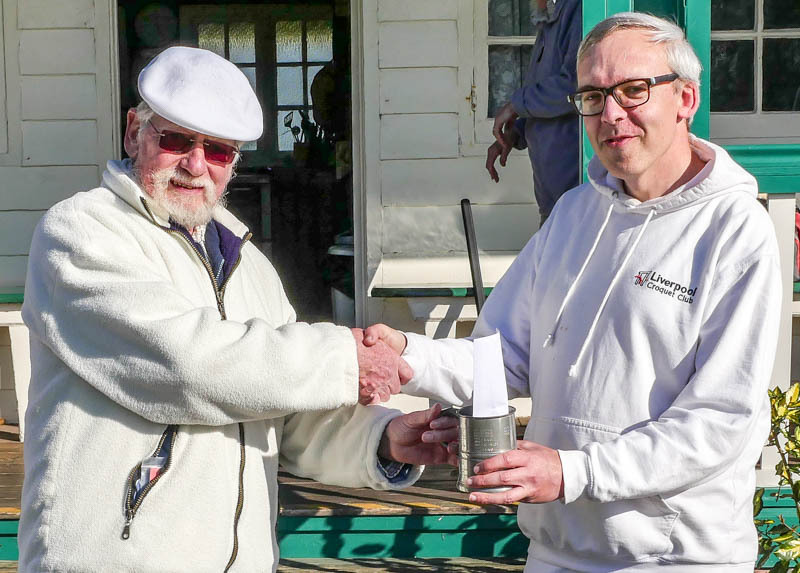 Under wonderful sunny Southport weather, the two finalists demonstrated Croquet skills of a very high order, but with James Hawkins producing sublime shots to take the title. There was much to entertain the spectators on the Sunday. In the deciding game of their best of three semifinal, Peter Wilson pegged out one ball leaving a three-foot shot to finish next turn, with Hawkins far behind on 2 and 4b. James hit his last shot, played 11 hoops under control, wired Peter from the peg and left him a 30-yard shot. Peter missed and James immediately finished with a +1 score. James then faced an identical scenario in the final against Paul Rigge. Paul had several attempted shots at the peg, but was tempted into one trap too many and James limped round to steal a second consecutive +1. In the second game, Paul failed to capitalise on James’s messy play around hoops. By the time he’d pegged out James’s forward ball he was already too far behind, and James took the final 2-0. 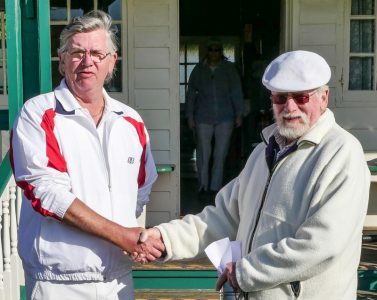 KNOCKOUT: James Hawkins bt Liz Wilson +22; Dave Nick bt Alan Pidcock +23; James Hawkins bt Dave Nick +3; Peter Wilson bt Peter Taylor +19; Paul Rigge bt Jerry Guest +13; Richard H Smith bt Mark Lloyd +21; James Hawkins bt Peter Wilson +4 -14 +1; Paul Rigge bt Richard Smith +24 +17; James Hawkins bt Paul Rigge +1 +14. 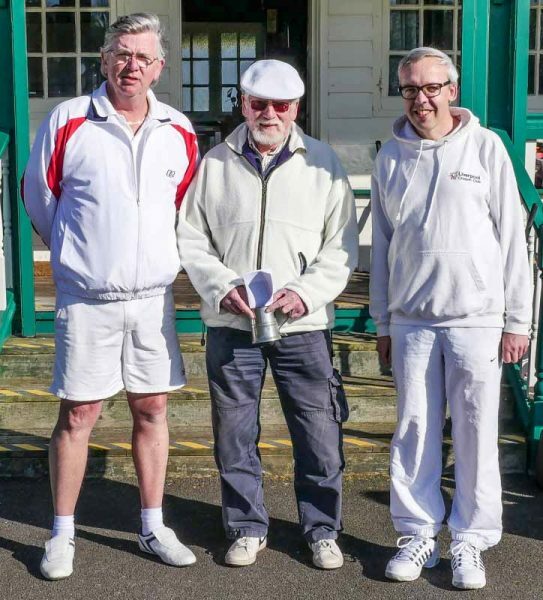 CONSOLATION EVENT: Peter Taylor bt Liz Wilson +1T; Peter Wilson bt Alan Pidcock +1T; Jerry Guest bt Mark Lloyd +10; Dave Nick bt Peter Taylor +17; Liz Wilson bt Alan Pidcock +11; Mark Lloyd bt Peter Taylor +12; Richard Smith bt Dave Nick +9; Peter Taylor bt Paul Rigge +15; Mark Lloyd bt Dave NIck +6; Richard Smith bt Liz Wilson +20; Alan Pidcock bt Jerry Guest +7; Richard Smith bt Peter Taylor +15; Mark Lloyd bt Liz Wilson +22; Dave Nick bt Peter Wilson +10.